And today we get to try out yet another style of tea. I love the fact that we have been able to check out black, green and now white all in the first week! 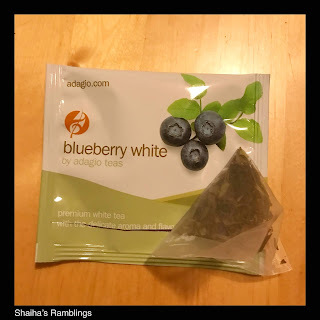 Our tea today is Blueberry White! Now I don't know why but I love blueberry teas even though they never seem to taste like fresh blueberries. This tea does come closer than a lot of them though with a flavor that reminds me of wild blueberries. The white tea itself is smooth and delicate. Oh and the aroma is to die for! This tea is definitely one that will be joining my tea lineup for 2019. For me, it is the perfect tea to wind up the day with; smooth, slightly sweet and low in caffeine. Now I wonder where tomorrow will take us? Any guesses?